The jigsaw puzzle piece is a fitting symbol for marriage, with each person being a different shape as determined by their interests, talents, beliefs and personalities. When two people with complementary shapes find one another, they are best able to connect together. These connections help the couples hold together as they journey through life. “The Theory of Everything” is a film about connection, the connections of love, loyalty and determination. 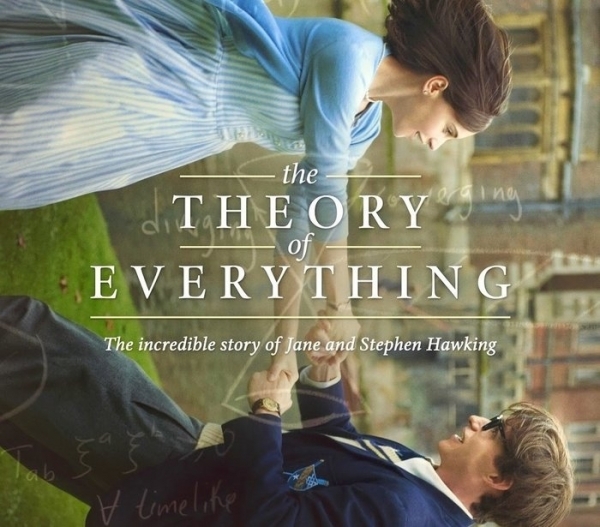 Based on Jane Hawking’s memoir,Traveling to Infinity: My Life With Stephen Hawking, “The Theory of Everything” depicts the life and love story of Jane and Stephen Hawking. Beginning in 1963 while both were pursuing Ph.Ds. the calm, cool, beautiful, devout Christian Jane met the awkward, eccentric, brilliant and avowed atheist Stephen Hawking, and despite the efforts of others, became enamored and soon fell in love with one another. Just as their love was blooming, Stephen received the devastating news that the increasingly persistent neurological issues he had been hiding were the result of ALS and he was given a life expectancy of two years of complete physical decline. Despite his best efforts to isolate himself from those near him, Jane overpowered his fear and ignored the advice of others by refusing to fade away from his life. The two married and set about what they thought would be a short, challenging life together where every day was to be cherished and each new obstacle met with determined love and creativity. B eset with physical challenges and routines that no one who has not been exposed to such a condition can hope to imagine, the two found a way to live, have and raise two children, and support Stephen’s groundbreaking physics research into the nature of time. As the two years that they thought they might have stretched into five, then ten, then fifteen, the challenges and pressures of increasing responsibilities as parents, partners, and Stephen’s growing fame, combined with his relentless physical decline, compound through the years, straining and wearing the jigsaw connection of their marriage. Eddie Redmayne gives and extraordinarily nuanced performance as he depicts Hawking’s gradual decline from an active 21 year old graduate student into a man in his 50s who is unable to speak and only able to move his finger and eyebrows. Redmayne’s ability to convey humor and other emotions from the twitch of his eyebrows mirrors those of Hawking whom he met him in preparing for the role. Felicity Jones also offers a subtly strong performance as she conveys the compounding effect of the growing pressure and demands required of Jane as she serves as the sole caregiver to her declining husband and mother to her three normally rambunctious children. James Marsh’s direction is light and restrained, allowing the story to evolve through the character’s performances and the use of home-movie style flash forwards in time. 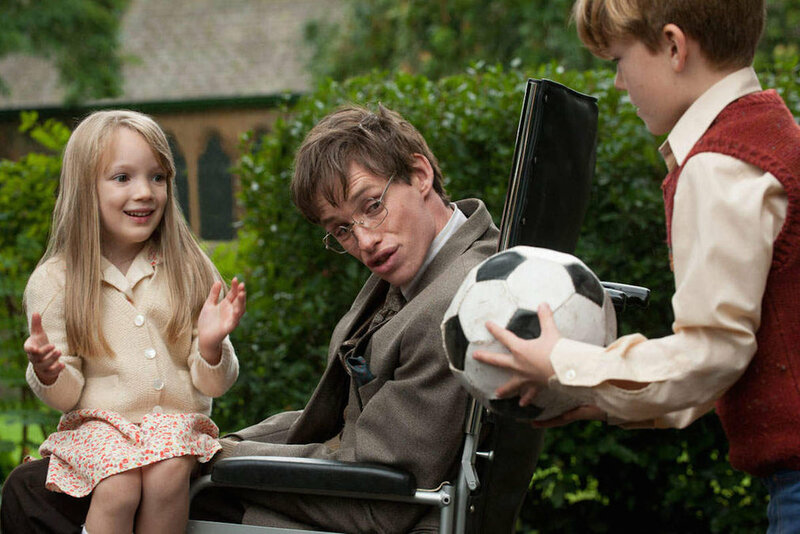 Anthony McCarten’s screenplay paces the story effectively with humor and tenderness as the weight of Hawking’s disability increasingly applies pressure to the characters, story, and viewers. In the fifth chapter of his letter to the Christians in Rome, the Apostle Paul speaks to the nature of suffering for the sake of Christ and his ministry, teaching that suffering produces endurance, which in turn produces character that yields hope which does not disappoint. Hebrews 12 also addresses the need for perseverance in running the race of life in faith. 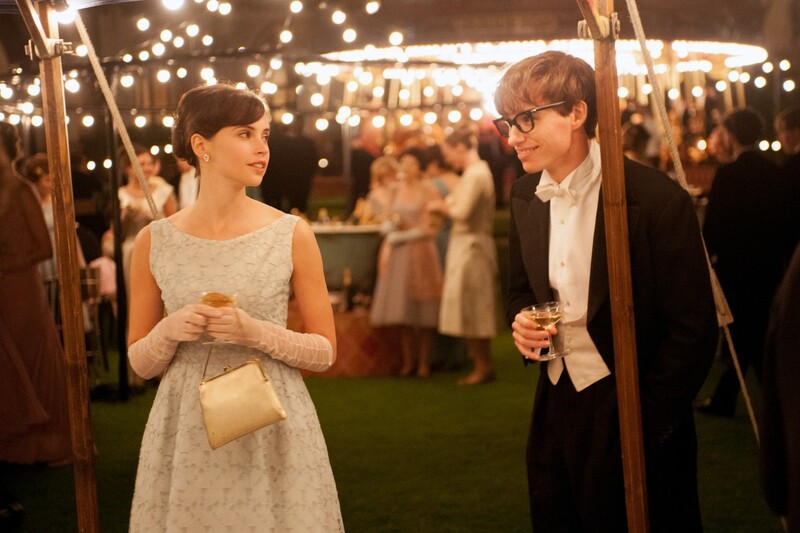 “The Theory of Everything” shows the unimaginable levels that can be achieved through faith and perseverance. While Stephen had great faith in his intellect, Jane had faith in the power and faithfulness of God to give her strength to endure and overcome. With Stephen willing to try, and Jane willing to support sacrificially, and both willing to risk, they were able to achieve success beyond anyone’s imagination. Yet, overcoming tremendous obstacles rarely occurs in a vacuum, and if that is the sole focus of an individual or a family system, the costs are paid elsewhere. When living in such challenging circumstances, the temptation is often to focus solely on the special ability or need of oneself or one in the family system while allowing other individuals or relationships to bear the brunt of the burden. In family systems this usually yields an identified individual, patient, who acts out against the pressure placed upon them as resources and attention are focused elsewhere, or relationships drift apart as the individuals are worn down from the demands and pressures that are not addressed and relieved through respite and care of oneself. While the film calls everyone to risk and persevere through all challenges so as to live up to one’s potential, care must be given along the way. Neither Paul, nor Jesus were able to persevere on their own as both saw to their needs by seeking and finding renewal and strength through prayer and time with God. When one, even with strong faith, goes it alone, the great likelihood is that they will break and or change significantly. In addition to being a parable of scriptural teaching, the film speaks directly to the issue of faith. From the beginning, Hawking makes an issue out of Jane’s faith in God and his faith in science, or more specifically, his faith in his theory of the universe being explainable in one ultimate equation. Persons of faith will probably find themselves debating Hawking’s notions and statements to Jane about her faith. Mine for instance were where in his equation or theory would he place love, the sacrificial love of Jane that drives her determination to care and support him through his challenges which allowed him to make his discoveries? Where in his equation is courage? Though initially lacking in Stephen, Jane demonstrated courage that empowered her to enter into a relationship she knew would be unimaginably difficult and, she thought, end shortly in his death? Lastly, why was his notion, that one equation could explain everything in the universe, and that such be worked out by a human, more explainable than the belief in a creator who created all there is in the universe? Persons whose faith, like Hawkings, is strictly in science would doubtlessly be asking similar questions to the faith claims by Jane. In the film, there is no question about living by and through faith, the question is what does one have faith in? Some have criticized the film because of the lack of attention to the scientific component. While the science is addressed from a distance and in general terms, this is not a film about science nor is it a film about Stephen Hawking. It is a film about the relationship between Jane and Stephen. As such it is a film about love, determination, faith, loyalty and their power to overcome tremendous adversity. It is also a warning to combine such with humility and attend to self-awareness and self-care. Science, if it can be explainable in one ultimate equation, is still faced with the fact that Science is discovering that which already exists. Faith, on the other hand is growing in character, and growing into things you previously didn’t possess and now are given as gifts (fruits of love, joy, peace, patience, kindness, goodness, gentleness, and self-control. We discover these only when we have had a change of heart and allow them to manifest and then come into being within us.